VENOM INC. - the trio formed by legendary Mantas, the Demolition Man & Abaddon - is set to kick off the next stage of their Blood Stained Earth World Tour. 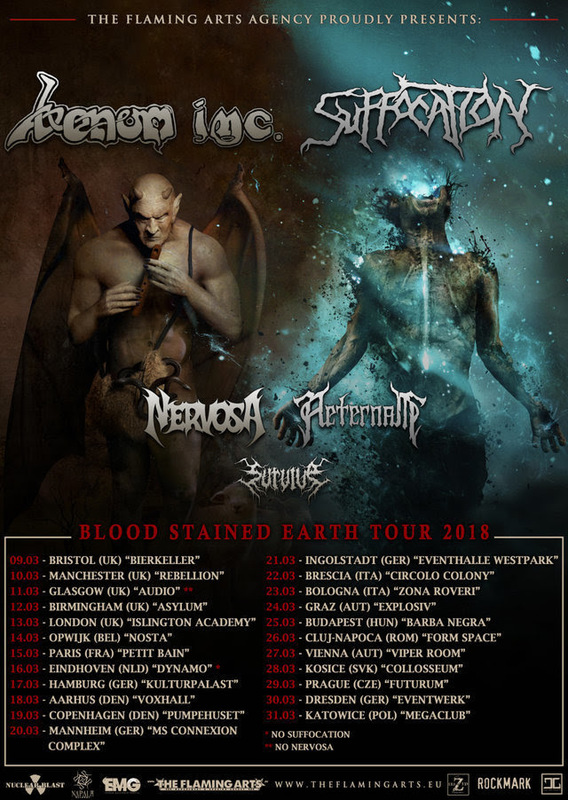 The first part will lead them through Asia plus Oceania, before the band haunt the UK and European clubs with labelmates SUFFOCATION, NERVOSA, AETERNAM and SURVIVE. In addition to presenting tracks from their debut album Avé, VENOM INC. will also perform a bunch of VENOM classics. gig news heavy metal release Lyric Video Mad About Rock Metal Metal News Music News Music Video new music Nuclear Blast Tony Dolan Tour Venom Inc.
Labels: gig news heavy metal release Lyric Video Mad About Rock Metal Metal News Music News Music Video new music Nuclear Blast Tony Dolan Tour Venom Inc.